This makeup artist's engagement ceremony is right out of a fairytale! Recently browsing through social media, I came across this dreamy engagement ceremony which I had to write about! 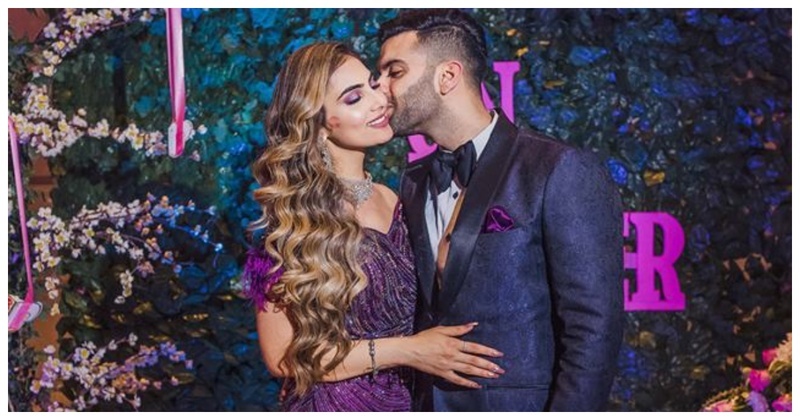 Innayat Trehan, a makeup artist from New Zealand got engaged to Karan Gogia in an intimate ceremony and right from her engagement gown to the decor of the event, everything was right out of a fairytale. I literally can’t take eyes of this shimmery ultraviolet custom-made gown from Roli Maheshwari with crystals, sequins and ostrich feathers! Also, totes in love with the off shoulder sweetheart neckline and that fringed details on the sleeves. She paired the gown with a stunning diamond choker and statement danglers and looked her stunning self. P.S her fashion game is totally on point, with ultraviolet being the colour of the year! Gives some major princess-ey feels right? As Innayat is a makeup artist, she decided to do her own makeup and here’s saying she did a stellar job at it. I mean just look at those soft smokey eyes, that flawless base, perfectly defined brows and a dash of pink on the lips. P.S totally loving them dramatic curls. These literally are giving me the ‘you can't sit with us vibes’!